1. how do I know when my food is perfectly cooked? It may seem obvious, but a thermometer is merely a tool that gives you information about the temperature of the food you are preparing. YOU have to make the decisions about when to increase or decrease the heat and about when things are cooked based on the information the thermometer gives. In most cases, you are looking for the highest temperature reached in the thickest part of the food to assess if the food is cooked. While different people like their meat or other food cooked to different levels of 'doneness', here is a chart of chef-recommended temperatures to get you started. 2. Where should I place the probe tip to see if it's cooked? When testing if your meat is cooked, the coldest part will be the very center of the thickest portion. With larger foods, you can take quick readings with your thermometer in several locations to verify that the entire portion is done. If you are chilling a food, the center of the thickest part will be the last to cool. Keep in mind that different types of thermometers have sensors of different sizes. A dial thermometer can have a sensor as big as an inch long and your reading will be an average of the temperature of all the different materials touching that sensor. Most digital thermometers have small sensors at their tip. Penetrate the food you are checking with the probe and place the very tip of the probe where you want to measure. 3. How frequently should I calibrate my thermometer? The word "calibrate" is often thought to mean making some kind of adjustment to a thermometer for accuracy. While adjustments are sometimes needed, "calibrating" a thermometer simply means testing its accuracy against a verifiable standard. If the thermometer is within the accuracy specification listed by the manufacturer or quality control agency, no adjustment should be made. When it comes to recommended frequency, there is a very wide range. Mechanical thermometers like dial thermometers should be calibrated very regularly if not daily, while digital thermometers are often only calibrated once a year. Check the stated recommendation for your type and model of thermometer or check with the appropriate health department or quality control agency with authority over your operation. 4. how do I calibrate my own thermometer? The answer depends upon the requirements of the presiding health department or quality control agency. Many organizations, including corporations, require lab calibration of thermometers for professional use. ETI maintains an in-house UKAS Traceable calibration lab that can provide Certificates of Calibration at multiple points traceable to the The United Kingdom Accreditation Service (contact us at service@etiltd.com or ask for the calibration lab on 01903 202151. While it is true that the most definitive test of a thermometer's calibration follows at least a 3-point method, the use of a properly made ice bath is a widely used test in the food industries and is recommended by most food agencies. 5. Why does my thermometer read higher than 32°F (0°C) when put in ice water? Probably, because the temperature is higher than the ice point unless you take the time to create a properly made ice bath. If the thermometer is, in fact, outside of its published accuracy specification, adjust accordingly or contact our Service Department (service@etiltd.com, 01903 202151). 6. Why can't I switch my thermometer on? Check the battery compartment. In many thermometers there is a small metal clip that holds the batteries in place. Even if the batteries are in place, if they are not under this little clip, the thermometer won't turn on. If the clip is in place and the thermometer still won't turn on, contact the ETI Service Department for advice (service@etiltd.com, 01903 202151). 7. My new thermometer reads different than my old one, why? Most probably, because your old thermometer is not as accurate as your new ETI digital thermometer. Test both thermometers in a properly made ice bath to check and adjust accordingly or contact our Service Department (service@etiltd.com, 01903 202151). 8. Why doesn't my thermometer settle on a final temperature in food? Primarily, because the temperature of food keeps changing while it is cooking, and your ETI digital thermometer is accurate enough to see it. Thermometers will only "lock in" on a given reading if they have a "hold" feature designed to do that. 9. how often should I clean my thermometer? You should wipe the probe clean with cleaning wipes or soap any time it comes in contact with raw meat, and you should wipe the whole thermometer casing after each use being careful not to get it wet. Never put the housing of your digital thermometer near water unless it has an IP rating of 66 or higher. WARNING - IPA and other solvents may cause damage to the case and screen of this instrument. 10. what is an IP rating? For an IP rating chart you can download, please click here! 11. Will atmospheric pressure affect temperature reading of Boiling Water? The boiling point of water is directly dependent on (atmospheric) pressure. It is a physical related property. Water boils at 100°C ONLY if it is pure (de-mineralized) and under atmospheric pressure of 1013.25 hPa. So at high altitudes or bad weather-low pressure, you may think that the instrument reads the wrong temperature. For example, Low air pressure at 990 hPa water will boil at 99.3 °C and at higher air pressure 1040 hPa water boils at 100.7 °C. 12. Why do I get different readings when I test my food in different places? Because the temperature of the food can be different in different places at the same time. It is not unusual for the internal temperature of a large roast or turkey to vary by as much as 20 to 30°F (10 to 15°C) throughout the meat or bird. Even a steak or a boneless chicken breast may show differences of many degrees as you move the tip of your thermometer probe from the surface toward the center of the piece, or from end to end, depending upon the speed and accuracy of your thermometer. 13. My ETI thermometer suggested medium but my steak was overdone, why? Because meat will continue to cook after you take it off the heat. This is called "resting." Cooked meat should be allowed to "rest" after cooking and before cutting. This permits the juices to be reabsorbed into the fibers of the meat. If you skip resting, you will lose more juices when the meat is cut. The temperature of the meat will always continue to rise a little during the resting period. Typically, even a small steak or individually cooked piece of chicken will rise at least three or four degrees during resting. A larger roast or turkey can rise as much as ten to fifteen degrees depending upon conditions. So you should remove your meat from the oven or grill prior to reaching your target temperature. Otherwise, it will be overcooked. 14. Why is my chicken still bloody - my ETI thermometer says it's done? Because the bone marrow in chicken bones can release blood while cooking. If the chicken has reached at least 71°C for five minutes or more, it is safely done. 15. What are the main food safety temperatures? The UK Food Agency publishes temperature guidelines for food holding and cooking . You can use your ETI thermometer to check temperatures and minimize food-borne illness in your kitchen. Bacteria thrive between the temperatures of 4.5°C and 60°C. Food should not be stored between these temperatures for extended periods of time. Some leftover foods must be reheated to minimum temperatures to assure sufficient "kill rates" of bacteria or parasites. 16. What precautions do I need to take when grilling with a thermometer? Never leave a thermometer inside an oven, grill, smoker, or microwave while cooking unless it is specifically designed for this. Don't leave your thermometer on the grill hood or close to an open flame. Some probes are designed to be left inside an oven or grill, but the thermometer housing itself (where the electronic components are kept) typically needs to be kept cool and should only be brought near heat for short periods of time. When checking temperatures above a grill or fire, be careful that the thermometer body does not get too hot. 17. Will my Thermapen / Thermometer work with an Induction Cooker? Most of our digital thermometers will be affected by the emf (electro-magnetic field) generated by the hob and there have been various studies as to the inherent dangers to humans in close vicinity to the active surfaces. Manufacturers recommend that metal spoons are not to be used, we are concerned that any metal in the design of a probe will be affected, and therefore produce errors. At this time, we would recommend recording results by heating pans, removing them from the influence of the hob and quickly taking a test measurement. We appreciated that rapid cooling will reduce temperature results, we also suggest an infrared thermometer like The IR-Pocket thermometer (814-060) which has adjustable emissivity or perhaps a Mineral Insulated probe. 18. What makes the Thermapen so fast compared to other thermometers? The main reason is the professional thermocouple technology that we use instead of mass-produced thermistor technology. Thermocouples are recommended by the most food standards agencies for measurement of cooked meat products and thin portions. We also use a reduced-diameter needle tip on the probe. Comparable professional meters cost £140 to £300 for the electronics and a similar probe! Some improvements were made in the sensor manufacturing process and the probe assembly in the new Splash-Proof Thermapen to make it just slightly faster than the original Super-Fast Thermapen. 19. Where can I buy a Thermapen? You can buy it right here online. ETI also has a network of authorised distributors worldwide. The ETI Thermapen is hand assembled in the UK and is a popular product so watch out for counterfeit Thermapen look-alikes. 20. Where can I get spare batteries for my Thermapen? The Thermapen 3 uses two coin cell batteries, CR2032, which are commonly found at many stores and retail outlets. You can also order spare batteries from us by clicking here. 21. How long should my Thermapen's batteries last? Thermapen batteries are rated for 1,500 hours of use. In the battery compartment you can enable and disable the auto-off feature. The auto-off feature will extend the life of the batteries. See your owner's manual for details. 22. Will the Thermapen tell me when my meat is done? 23. I've seen cheaper thermometers, why pay more for a Thermapen? 24. What makes the Thermapen so fast compared to other thermometers? All Infrared thermometers sold by ETI Ltd, that have Laser Pointers, comply with BS EN 60825-1: 2014: - Safety of laser products: Part 1. Equipment classification and requirements:- Class 2. The basis of this EU Harmonised Standard is that the laser should be strong enough to make someone blink but not strong enough to damage tissue.This therefore prevents damage to the eye unless someone deliberately stares at the laser light for a long time, causing self-inflicted injury. i.e. For consumer laser products in general there is a requirement that, by employing technical means (i.e. engineering controls), lasers shall not cause damage to the eyes or skin under normal and reasonably foreseeable conditions of use, including momentary accidental or unintended exposure.Also any laser should not be shone in anyone’s eyes; it can be very distracting and could result in a serious incident.We strongly recommend that the laser is only used to help target the area being measured, indicating the optical ratio of the instrument. 26. Can I check grilling temperatures with an infrared thermometer? Aiming an infrared thermometer at a porous surface like a grill or grate, will factor in the surface temperature of whatever surfaces are visible through the holes of the grill or grate when calculating a final temperature for your reading. To accurately measure the temperature of a porous grate or grill, place a solid surface like an iron plate or skillet on the grill, let it come to temperature and measure the plate or skillet. Then spray a little cooking oil on the plate or skillet to ensure proper emissivity. "Emissivity" is a measure of a material's relative ability to emit radiated energy. It is measured on a scale from just above 0.00 to just below 1.00. Emissivity depends on factors such as temperature, emission angle, and wavelength. Generally, the closer a material's emissivity rating is to 1.00, the more that material tends to absorb reflected or ambient infrared energy and emit only its own infrared radiation. Most organic materials, including the byproducts of plants and animals, have an emissivity rating of 0.95. Check your infrared thermometer to see if it has adjustable emissivity settings as a feature. Then check your target material against this Emissivity Table. 28. Can I check if food is properly cooked with an infrared thermometer? Infrared thermometers only measure surface temperatures, so they are not very effective at testing if food is properly cooked. Use traditional probe thermometers for this. If using an infrared thermometer with liquids like soups and sauces, ensure you stir vigorously before taking a measurement to more closely approximate the internal temperature of the liquid. Be aware that steam, even when a liquid is not boiling, can condense on your thermometer and affect the accuracy of your measurements. 29. Can infrared thermometers work through glass or clear plastic? An Infrared thermometer will NOT measure temperature accurately through glass, liquids or other transparent surfaces even though visible light (like a laser) passes through them. If you point an infrared thermometer at a subject through a closed window, you will be measuring the surface temperature of the window itself, not the object you are aiming at. 30. Can an infrared thermometer measure temperature through water? No. As in the answer above and for the same reasons, an infrared thermometer will only measure the surface temperature of water, not the object's temperature. 31. What do spot size, spot ratio and distance to target ratio mean? Usually listed on the thermometer itself, the "distance to target ratio" (DTR) or "spot ratio" tells you the diameter of the "circle" of surface area an infrared thermometer will measure at a given distance. For example, an infrared thermometer with a 12:1 ratio will measure the temperature of a 1" diameter circle of surface area from 12" away, a 2" diameter circle of surface area from 24" away, and so on. 32. Do I need to clean my infrared thermometer? For accuracy, an infrared thermometer should be kept free of dirt, dust, moisture, fog, smoke and debris. Always take the time to clean your infrared thermometer after exposure to a dirty, dusty, smokey or humid environment. You should also plan a regular cleaning every six months or so. Particular care should be taken to keep the infrared lens or opening clean and free of debris. Never submerge any part of the thermometer in water. 33. How do I turn the laser on? That will depend on the model or type of your infrared thermometer. Read the user manual that came with your infrared thermometer to lear about the full range of features it offers and how to use them. 34. I am getting strange readings on shiny metals, why? Highly-polished metals typically have very low emissivity ratings, as they tend to be very reflective of ambient infrared energy and less effective at emitting their own electromagnetic waves. If you point an infrared thermometer with fixed emissivity at a stainless steel pot filled with boiling water, you might get a reading closer to 100°F (38°C) than 212°F (100°C). That's because the shiny metal is better at reflecting the ambient radiation of the room than it is at emitting its own infrared radiation. Some infrared thermometers have fixed emissivity settings of (usually of 0.95 or 0.97) to simplify their operation while leaving them suitable for most material surfaces, including almost all foods. Other infrared thermometers come with adjustable emissivity settings, so you can more accurately prepare your thermometer for the type of surface being measured, particularly when measuring non-organic surfaces. 35. Can I calibrate my infrared thermometer? 36. Why does my RF Logger base-station seem to turn off after a few days? 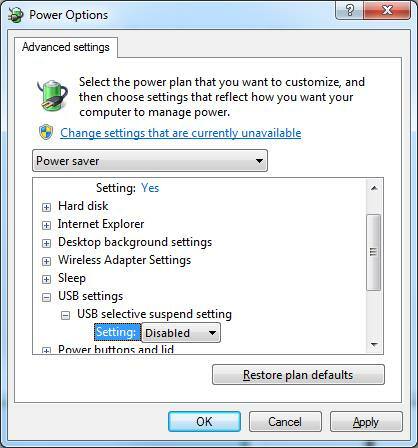 This may be because of the feature of Windows, USB Selective Suspend which activates and turn the USB port power off to the base station. 2. 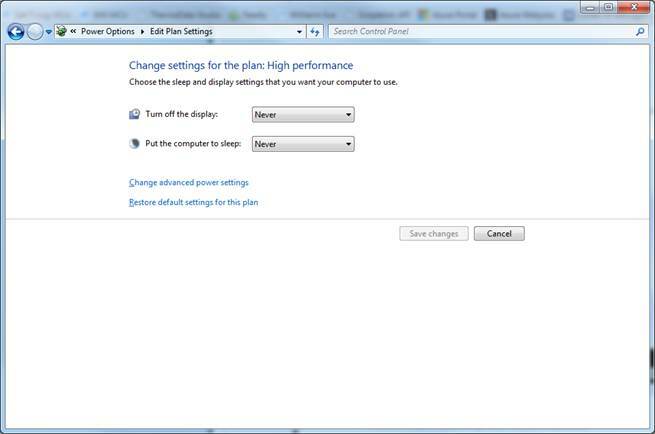 Click "change plan settings"
3. 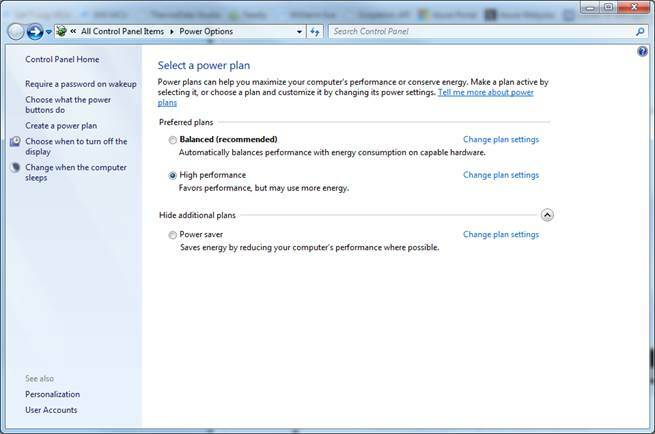 Choose"Change Advanced Power Settings"
37. Where do I find the latest software for my data logger? Every ETI data logger comes with its own ETI developed software. You can download the software for your logger by viewing your data logger in our online shop, then clicking the download tab that appears on the relevant page. Alternatively visit our dedicated Software Downloads page. 38. My data logger came without a printed user manual, why? ETI care for the environment. Therefore all our logger systems don't come with a resource wasteful, printed copy of the user manual, instead it is included on the software installation CD that came with your datalogger. It may also be downloaded directly from the individual product pages on this website by visiting the appropriate logger page and then clicking the download tab. 39. How do I download my logger data to my computer? Some of our data loggers come with built-in cable connectors or wireless capability that can connect directly with your computer, others require the purchase of a separate cradle or data dock that connects directly with your computer through your USB port. 40. My data logger isn't working, why? The most common problem in getting your logger up and running is loading the correct drivers. This can usually be ascertained by looking in the System Device Manager on your PC. Another common problem is failure to install the required software and registerering each logger unit before installing them. If you need help, please don't hesitate to contact our Service Department service@etiltd.com, 01903-202151. 41. Does my data logger require any setting up before use? Yes. Some of our data loggers come with preset defaults and are ready to use right out of the box but others will only work once they've been set up by selecting settings directly on the logger unit or by using a computer-driven wizard and registering each unit with the controlling software. Even units with preset defaults should be customized to your particular needs (high and low alarms, frequency of measurements, etc.) before use. 42. How do I differentiate between multiple loggers in my data? One of the key settings for your logger units is to give each different unit a name to differentiate it from the other units on the same network. Most people use either a number or a location or type of material being measured to name their loggers (i.e. "logger1" or "upper_freezer" or "raw_fish").